My officemates decided that we tour Corregidor for our annual Field Trip. So, we packed our bags and headed to the Island Fortress of Bataan. Corregidor stands as a memorial for the courage, valor, and heroism of its Filipino and American defenders who bravely held their ground against the overwhelming number of invading Japanese forces during World War II. Also known as "the Rock," it was a key bastion of the Allies during the war. When the Japanese invaded the Philippines in December 1941, the military force under the command of Gen. Douglas MacArthur carried out a delaying action at Bataan. 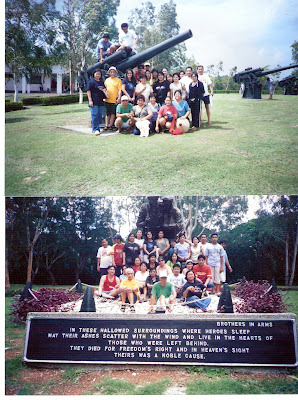 Corregidor became the headquarters of the Allied forces and also the seat of the Philippine Commonwealth government. It was from Corregidor that Philippine President Manuel Quezon and General MacArthur left for Australia in February 1942, leaving behind Lt. Gen. Jonathan M. Wainwright in command. Although Bataan fell on April 9, 1942, the Philippine and American forces held out at Corregidor for 27 days against great odds. On May 6, 1942, their rations depleted, the Allied forces were forced to surrender Corregidor to Lt. Gen. Homma Masaharu of the Japanese Imperial Army after having successfully halted the Japanese advance on Australia. It was only two years and ten months later in March 1945 when the Allied forces under the command of General MacArthur recaptured Corregidor ... making good his promise to return to the Philippines. The big guns of Corregidor are now silent and the ruins of buildings, structures, and tunnels in the island tell a very moving story of a war that has claimed so many lives. A visit to this former battleground is a memorable experience especially for those who cherish and value peace and freedom. In his speech delivered at the signing of the surrender of Japan aboard the U.S.S. Missouri at Tokyo Bay on September 2, 1945, General Douglas MacArthur said, "It is my earnest hope and indeed the hope of all mankind that a better world shall emerge out of the blood and carnage of the past - a world founded upon faith and understanding, a world dedicated to the dignity of man and the fulfillment of his most cherished wish for freedom, tolerance and justice." An ovenight stay there is surely enough to bring back on our memories the struggles that our compatriots have gone through just to fight for our freedom.